At Hovland’s we understand how important indoor air quality is for a healthy home. That’s why we sell and service all types of indoor air quality (IAQ) products relating to filtration, humidification and ventilation. Our experienced staff will work with you to identify a solution for whole-house air purification and conditioning that meets your needs. Filtration – The PureAirTM Air Purification System from Lennox cleans the air in your home better than any other single system you can buy and is the only single IAQ system to attack all three classes of indoor air contaminants. 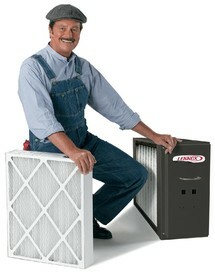 The Lennox Healthy Climate® HC16 Media Air Cleaner is the only MERV 16-rated whole-home media filter. These products are designed to work with your heating and cooling system to deliver cleaner, fresher air throughout your home. Humidification – Dry air in your home can result in many irritations including dry, itchy skin, scratchy throats and upper respiratory problems. Trust your comfort and your home to an Aprilaire Automatic Humidifier. Since 1954, Aprilaire has led the industry, setting the standard for whole-home humidification. We offer the full line of Aprilaire humidifiers – each one made specifically to meet the humidification challenges of many different homes and heating systems. Ventilation – The Lennox Healthy Climate® Heat Recovery Ventilator (HRV) replaces stale indoor air with fresher, cleaner outside air. Designed for colder climates, it retains heat from the indoor air and works with your central heating and cooling system to enhance the air throughout your home.